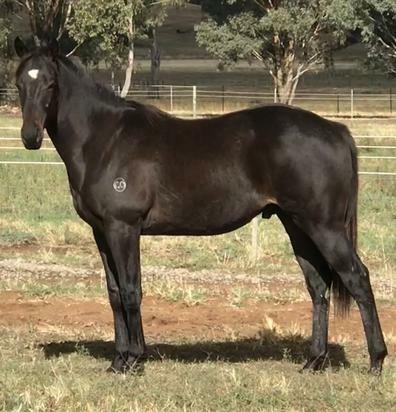 KUROSHIO (AUS) (Bay or Brown 2010-Stud Aust. 2014, GB 2015). 3 wins-2 at 2-at 1000m, 1100m, A$327,400, MVRC Ian McEwen S., Gr.2, MRC Blue Diamond Prelude (c&g), Gr.3. Brother to SW Believe'n'succeed. Sire of SP Dunkerron, Daphinia and of Daishio, Big Ace, Savatoxl, Kapono, Kurious, Not Usual Current, Tidal Rose, Yulong February and of the placegetters Siculi, Makkem Lad, Mikuro, etc. His oldest progeny are 3YOs. Lager (g. by De Beers). Winner at 1000m in 2017-18 in Aust. Faith in Beers (g. by De Beers). Winner at 1200m in 2017-18 in Aust. TRIBULUS - FOX COMMAND (Mal.) (Testa Rossa). 6 wins from 1200m to 1600m, A$59,707, 785,619Rgt. in Aust. and Malaysia, Perak TC Coronation Cup, L, 2d Perak TC Coronation Cup, L, MRC Midnight Fever 2YO P., Alan Currie 2YO H., Selangor TC Chairman Guineas Trophy, Perak TC Dato Yeoh Cheang Lee Memorial Trophy, SAJC TK Engineers & Constructors H., 3d VRC Inglis Series 2YO H., MVRC IGA Local Heroes 2YO P., Selangor TC Piala Emas Sultan Selangor Trial, MVRC Tatts Group H.
In Faith (Keep the Faith). 8 wins-2 at 2-to 1400m, A$257,590, MVRC Inglis Melbourne Premier Sale 2YO P., SAJC Caroma 2YO P., WATC Dr Jack Carroll Memorial H., Geraldton TC Batavia Sprint H., 2d Bunbury S., L, WATC Blue Heeler H., 3d WATC Singapore Turf Club Trophy H., McKenna Hampton H., Budget Minibus Rental H.
Faith in Fate. 9 wins to 1200m, A$94,159, to 2018-19, WATC North Fremantle Amateur Football H., 3d WATC Hahn Superdry H.
Spend the Money. 3 wins at 1000m, 1100m, 2d WATC Chancery Star H., Constructive Media H.
Twenty Carats. Winner at 1400m in Aust. Bosbarawana. 4 wins-1 at 2-from 1300m to 1600m in Philippines, Philippine RC Amethyst III S., Manila JC Garnet III S., 3d Manila JC Chairman's Cup. Hugo Bozz. 10 wins at 1200m, 1400m in Philippines. Barawanawest. 10 wins to 1550m in Philippines. Vanilla Ice. 6 wins to 1400m in Philippines. Sotogrande. 3 wins-2 at 2-at 1300m to 2018 in Philippines. Catsbarawana. Winner at 1400m in 2017 in Philippines. Greenheart. 3 wins-1 at 2-to 1200m, MRC Clive Leonard H.
Participant. 3 wins at 1000m, 1200m, 2d SAJC Emblem Boy 2YO H.
Peace Dance. 7 wins to 1300m in Aust. O'Well. Winner at 1000m in 2016-17 in Aust. La Vie da Loca - Suave Warrior (Sing.). Winner at 1200m in NZ. DIVINA ESTATE (State Dinner). 6 wins-4 at 2-from 1100m to 1700m, Criterium di Roma, Gr.3, Rome Premio Alessandro Perrone, L, Premio dei Fiori, Premio Monte Giove, Premio Marguerite Vernaut. Producer. Invoice. 5 wins from 1300m to 1600m, QTC Bengalla Lad H., 2d QTC Fine & Dandy H., 3d Qld Tatt's RC Bowls Club H., QTC Paint the Town Red H.
Dewana. 5 wins. See above. Winning Table. 2 wins at 2, AJC Young Crusader 2YO H., STC Tranmore 2YO H., 2d STC Chester 2YO H. Producer. Suspended Gem. 5 wins from 1750m to 2200m, A$118,145, to 2016-17, MRC Schweppes H., 2d MRC Guinot Skincare H., Traralgon Cup, 3d VRC Bitalli H.
DEWANADANCE (Dewan). 5 wins. See above. SHE'S DEWAN (Dewan). 6 wins-1 at 2, Fairmount Park Rosebud S., L, 3d Ak-Sar-Ben Ambassadors' H., L, Lincoln Inaugural H., L. Producer.